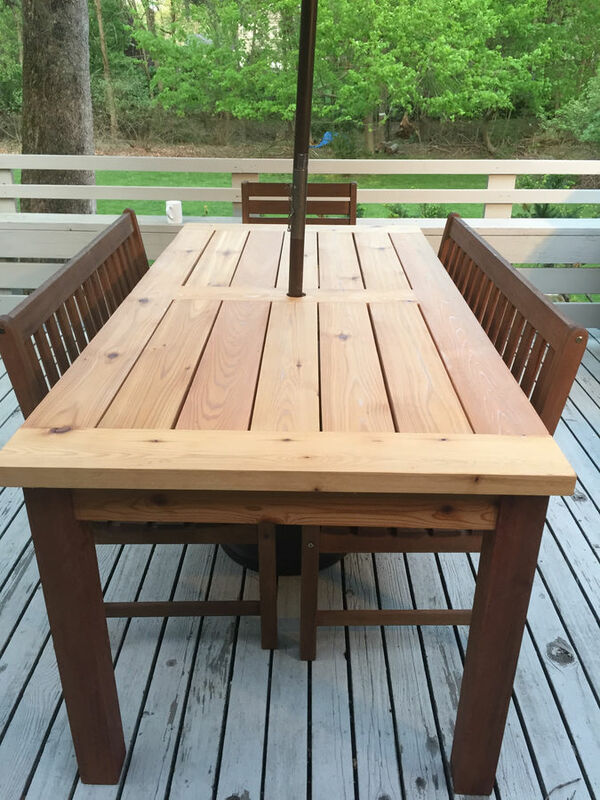 This outdoor table was inspired by several other designs online. 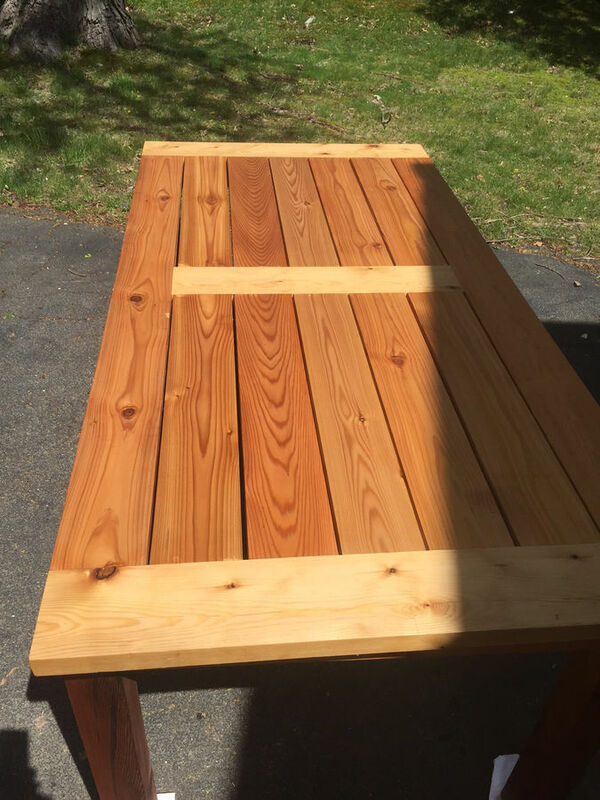 Made from a cedar 4x4 for legs, 2x8 ripped in half for aprons, and 2x6's for the top. The top is entirely made with dowels and titebond III glue. 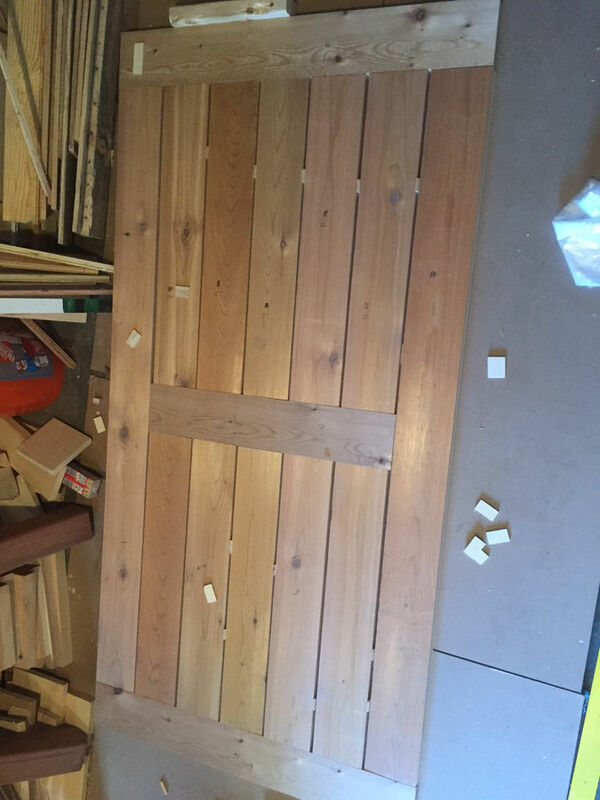 The aprons are mortise and tenon joints into the legs, with glue blocks for additional support. The top is fastened to the base with exterior (blue) pocket screws. 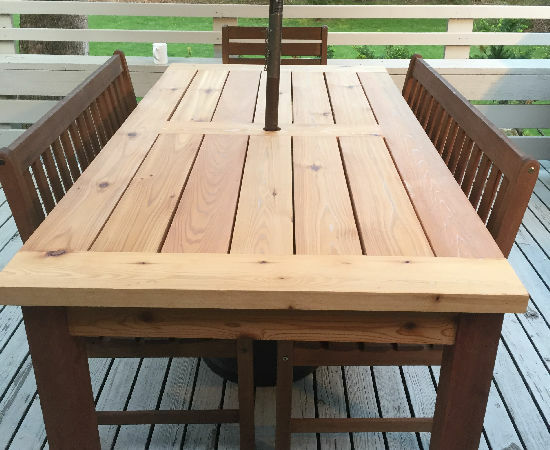 The table was finished with 2 coats of teak oil. 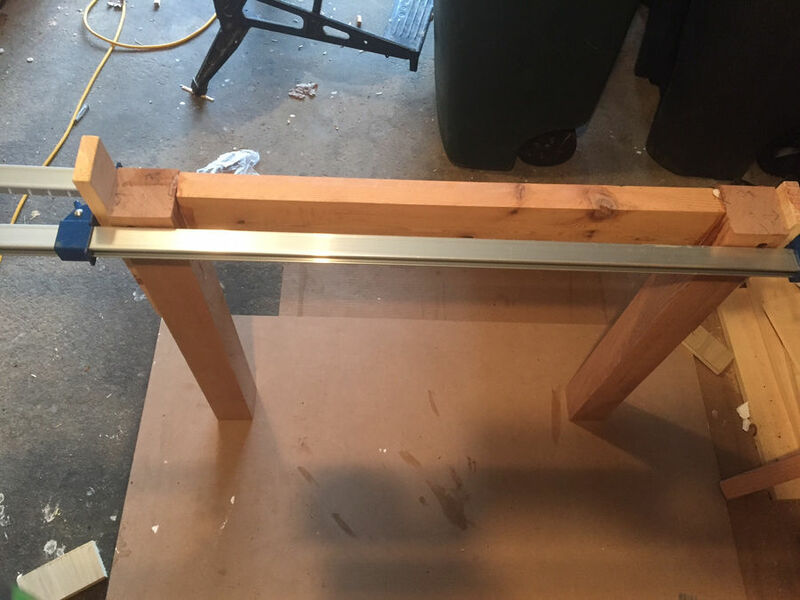 After cutting the top boards to length, I arranged them on the ground with 1/4" plywood spacers, using a pencil to mark where the dowels will go. 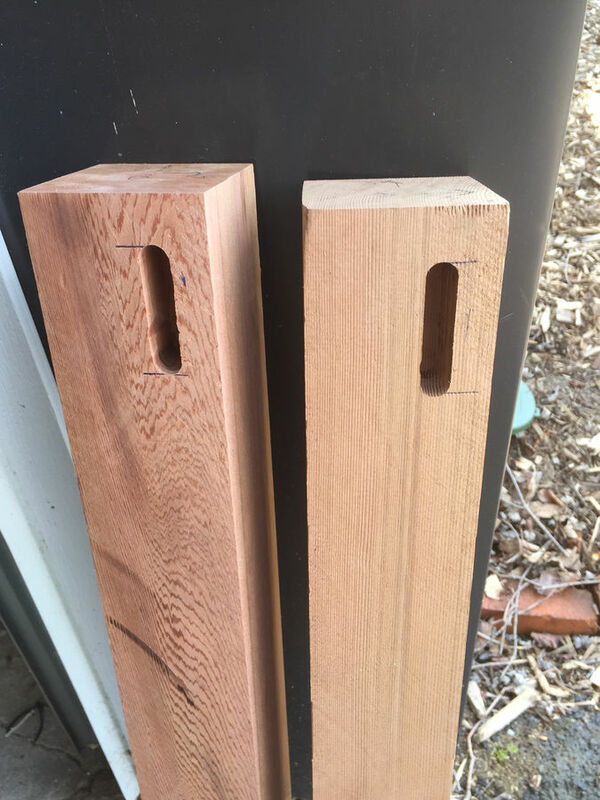 2 per board, ~1" from each edge (no exact measuring). Dowel drilling time. 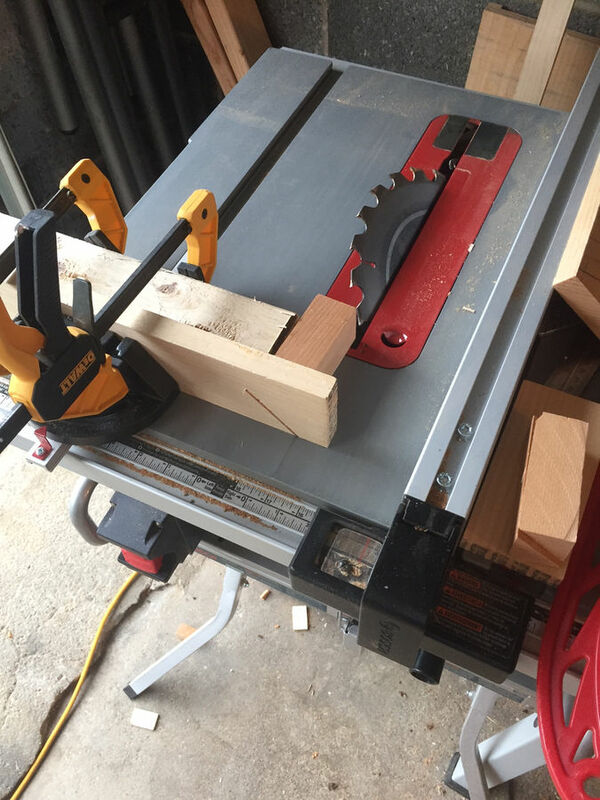 This $15 jig from Harbor Freight was a great investment. It worked surprisingly well. 104 holes drilled and every dowel fit with minimal whacking. 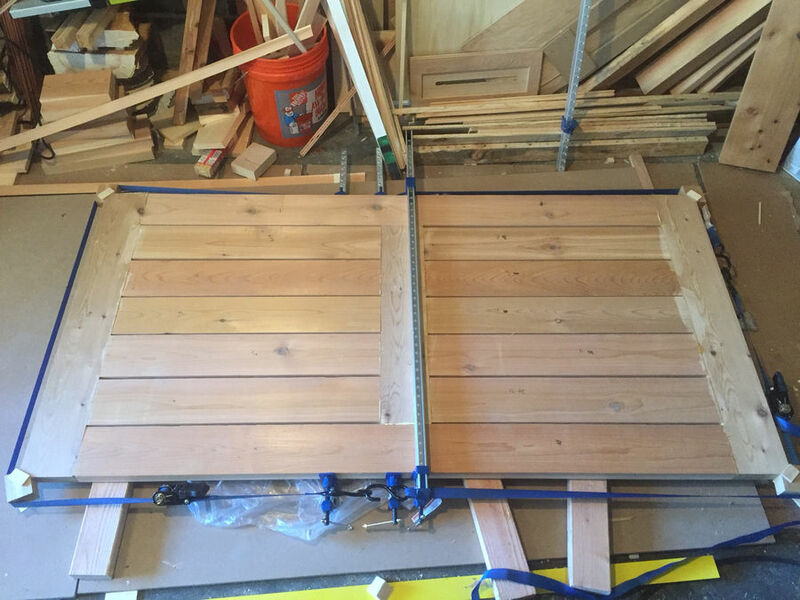 This was a complicated glue-up for me, who could use a ton more clamps. I did it in 3 sections. First I glued the small interior board into each "breadboard". Then I glued the two sections into the middle board and long side boards. I used clamps only on the middle section of this picture, and ratchet straps to push the 2 big sections into the sides of the middle board and long side boards. I hope that makes sense, but there are probably easier ways to do this. 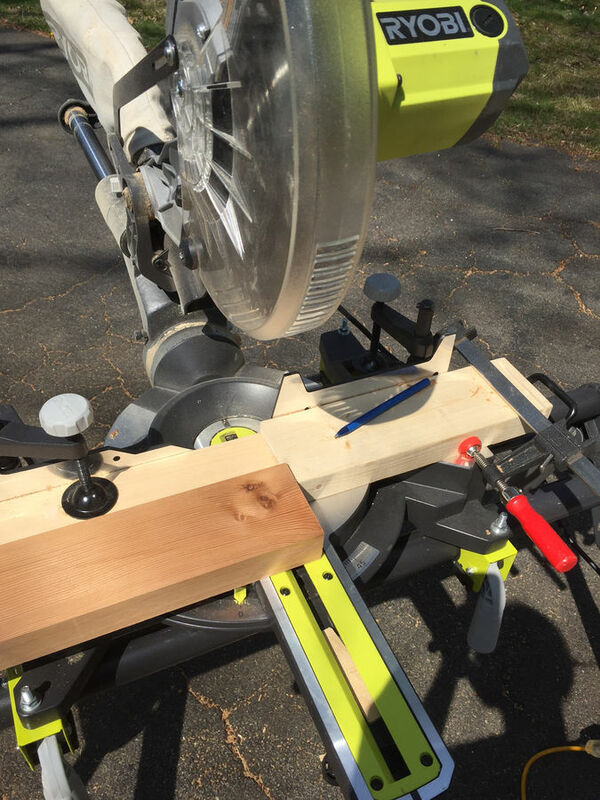 In fact, there are much easier ways to make a table than with dowels and glue. 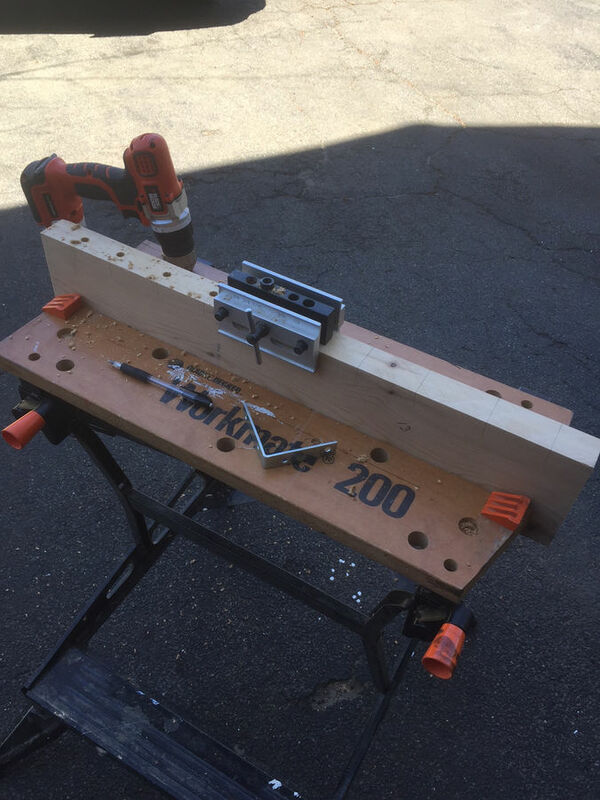 Here is my makeshift mortise setup. 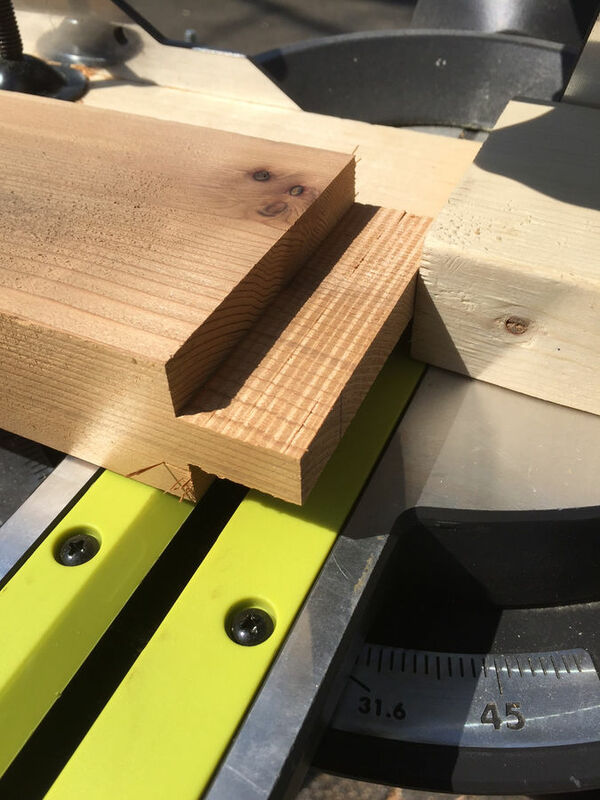 I don't have a plunge router, so I made 4 shallow 1/4" passes with a trim router and clamp as a stop block (eyeballed the other end). I found this much easier and consistent than drilling or hand chiseling. 2 legs down, 2 to go. 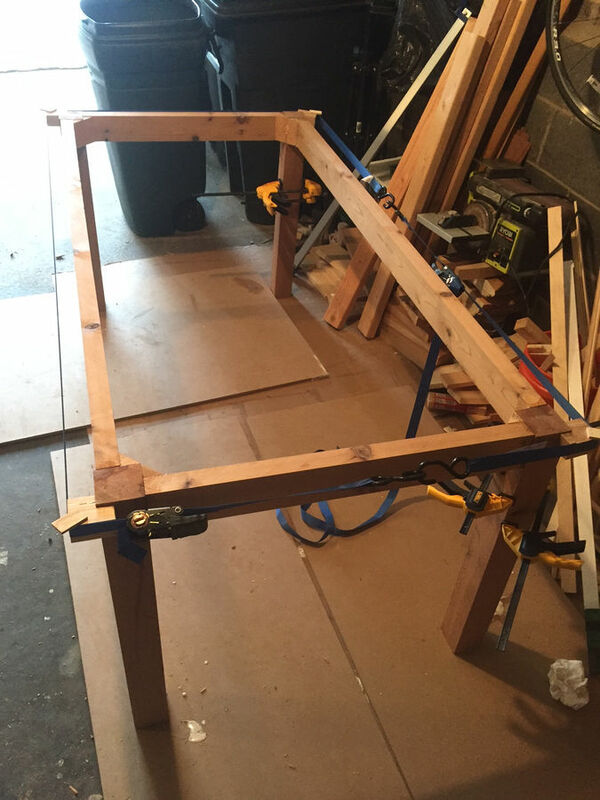 The tenons are not symmetrical; I left extra room on the top of the legs for strength. 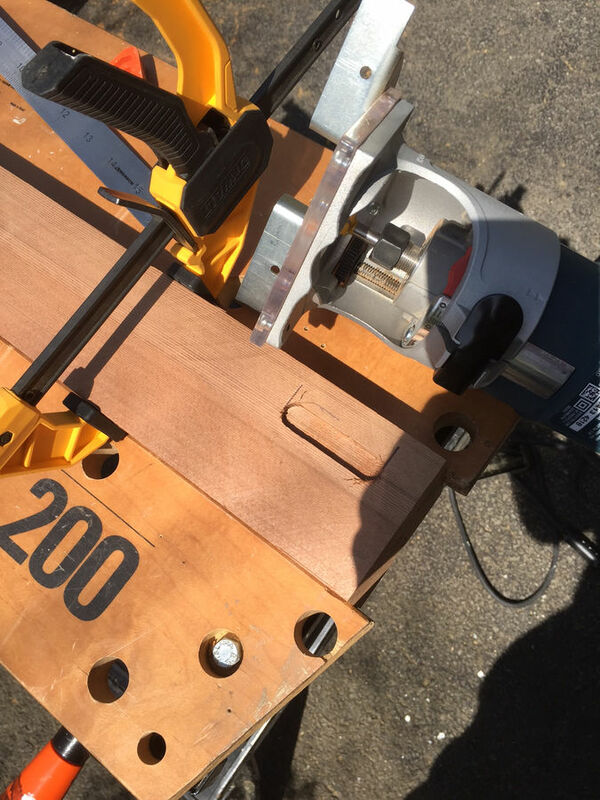 I don't have a safe way of cutting tenons on my portable table saw, so the miter saw with the stop block was the fastest way to go. It worked surprisingly well. cut the shoulders by hand, then rounded with a chisel. I then progressively chiseled the tenons and sanded them until they fit into the legs. Loose enough to not need much force, but tight enough that you could pick the leg off the ground while holding the apron. Glued up the small sides first with 4' F clamps from HF. 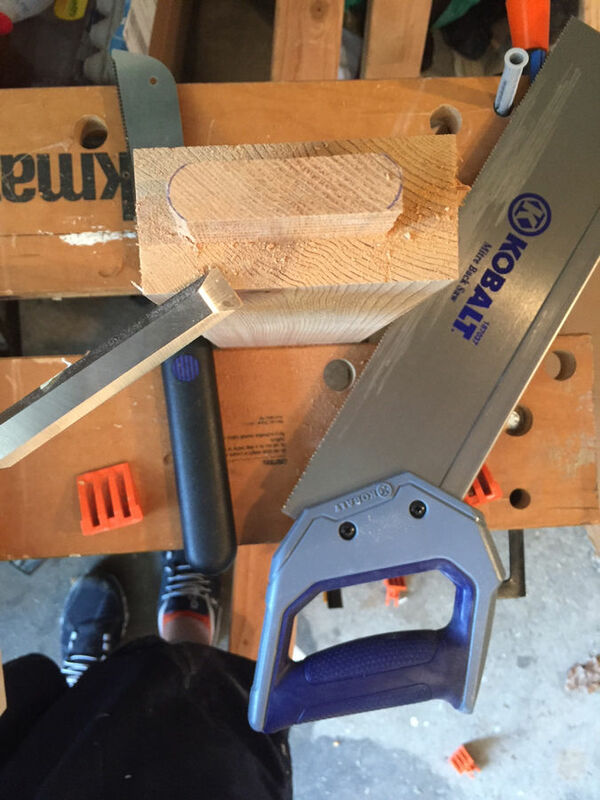 This was not the safest or fastest way to make glue blocks, but I didn't feel like setting up the miter saw again. Table base all glued up. Again with ratchet straps because I don't have 6 foot clamps. I finished this table with 2 coats of teak oil, which I think it basically Danish oil with some UV protection. In real life the breadboards/middle board do not look lighter than the long boards; this is just some weird lighting. I got this idea from The Wood Whisperer. I'm sure it will need to be reapplied once or twice a year, but it's so simple to do that I'd prefer this over a film finish that needs to be sanded/scraped off every 3-4 years. Only time will tell if this was a good idea or not. Great looking table! Thanks for sharing.